The children went back to school today. I miss them a bit but it's nice how the house stays tidy lol. I had my first driving lesson this morning, very exciting. Also rather scary, it's strange how driving along at just 20mph feels like you're going incredibly fast. My instructor had me driving up and down a quiet road and then at the end of the lesson he got me to drive home. Apparently I did alright, I hope I didn't annoy too many drivers who had to follow behind me as I slowly made my way along the bendy road lol. I've cast on a new project after finishing my shawl. It's a sweater for my eldest boy using the Little Spare Time pattern. I showed him lots of different patterns but this one caught his eye because of the cosy collar. Aside from the collar detail it's a pretty straight forward raglan sweater. I am going to do pockets as he likes to keep his hands warm so I'm just knitting until I get to the right length at the moment. Good for working on when I'm tired and not able to concentrate much. Mr Soaring Sheep has requested a cardigan after I showed him this pattern on ravelry. Isn't it gorgeous? He even wants it in the same pinky purple colour. I think I'll wait a while before casting it on though, I expect with having a new puppy arriving on Saturday, driving lessons and tennis lessons my mind is going to be a bit busy for concentrating on all those cables lol. What a beautiful color! 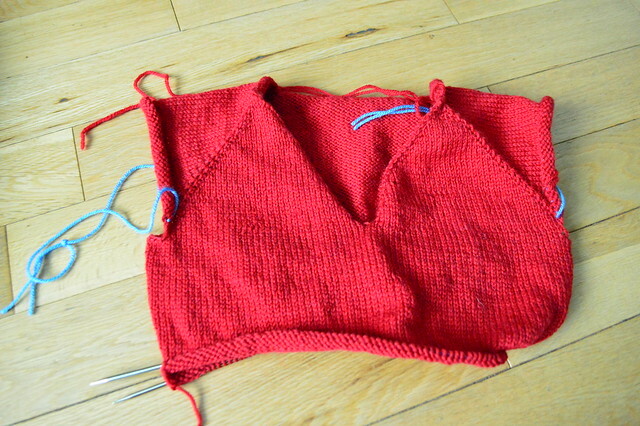 I am slightly obsessed with top-down raglan construction right now. Can't believe it took me so long to get to it! I admire a man who isn't afraid to wear a pinky-purple sweater! Sadly, when my kids went off to college, I discovered that I was the messy one! The pattern on Ravelry looks great xxxx Well done with your driving lessons, keep going. Ooh, you have lovely jumpers mentioned here. You are such a terrific mum. It takes a real man to be able to wear that color; your husband rocks. And yay on the success of your first, driving lesson. I learned later in life too, right before 30 since I had all these teacher manuals to lug about and had moved across town. That sweater your son choose looks super cosy looking, and that cardigan for your husband is awesome. I love that your husband will wear such fun colors. Good luck in your driving lessons! I can see why he chose that pattern< I love the collar too! Can't wait to see more puppy pics!! Good luck with the driving lessons - I've been driving ten years and there are still days when I find it scary. I'm sure you'll get the hang of it. Good on you for learning to drive - you will get there, just keep going. Love the sweater and the cardigan. go you and the driving! I assume everyone drives because here everyone does. However my daughter who does have a driver's license does not drive...oh well. Good luck and don't worry about the other drivers, it's a lesson in patience. Everyone was a beginner once. Love your new knit! !